WILLS POINT, Texas — While many Westerners might smirk at the notion of World Toilet Day, the problem of poor waste sanitation practices affects one third of the earth’s population and kills hundreds of thousands each year. Gospel for Asia (www.gfa.org) takes the problem seriously and is doing something about it in South Asia. 2.4 billion people around the world have no access to healthy sanitation practices, with 1 billion having to go in the open, according to the United Nations. More than 280,000 die annually from inadequate sanitation, says the World Health Organization. Gospel for Asia observed the United Nations’ World Toilet Day Nov. 19 to address one of the most persistent public-health issues facing many nations today. Common outcomes of inadequate sanitation include cholera and dysentery. All around the world, those living without access to private toilets must seek outdoor privacy before dawn or after dusk for relief. Not only is this inconvenient and uncomfortable, but quite often it’s unsafe, particularly for women. In one village in India, a widow named Piya received assistance from her Gospel for Asia-supported pastor, when he realized the family’s need. As a result, the family received a private toilet. Gospel for Asia has traditionally addressed both sanitation and potable water issues. In 2014, the ministry constructed more than 1,600 toilets, dug more than 5,600 “Jesus (water) Wells” and distributed almost 6,000 BioSand water filters to purify drinking water. Gospel for Asia has been constructing toilets since 2012. The largest number ever presented at one time was in December 2014, when 126 toilets were given as Christmas gifts. 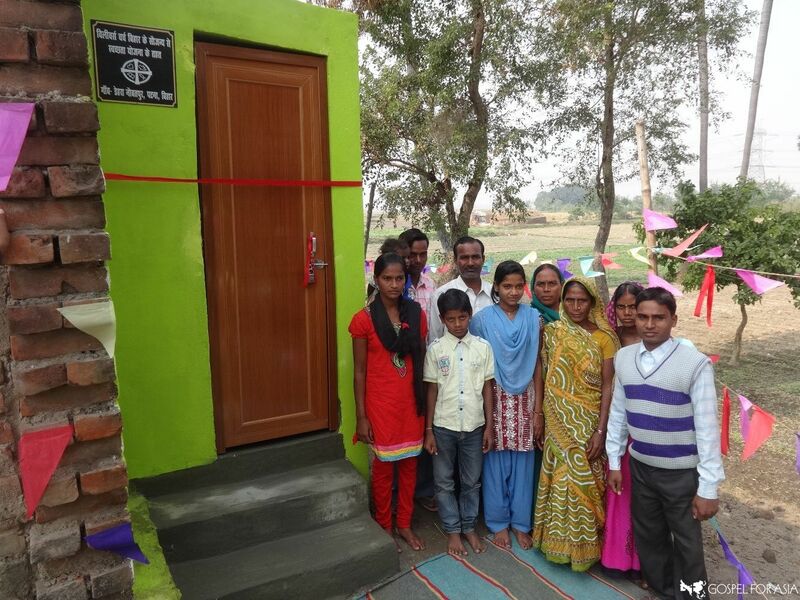 The goal for building toilets in 2016 is 15,000. One district even set its own goal at 8,000. Another has a goal of 500. The goal for new wells in 2016 is 5,000. The goal for new BioSand filters is 12,000. Toilets typically cost $160 to construct a structure that provides privacy. Installing and equipping “Jesus Wells” cost about $1,400 and typically serve an entire rural village. BioSand filters cost $30 and serve several families. More information about Gospel for Asia’s commitment to water availability and quality and sanitation is available at www.gfa.org. Gospel for Asia (www.gfa.org) is a mission organization sharing the love of Jesus across South Asia. A family stands beside their newly constructed toilet facility during a World Toilet Day celebration in northern India. Gospel for Asia observed the United Nations’ World Toilet Day Nov. 19 to address one of the most persistent public-health issues facing many nations today.